Marilyn Sommers manages human resources at Applied Marketing Science (AMS). In her role, she is responsible for all aspects of HR for the practice including recruitment, training, benefits and employee relations. She enjoys working with the staff and ensuring that they have the best experience they can have so that they can be successful in their roles. Marilyn joined AMS with 14+ years of hands-on human resources management experience, specifically with small to mid-size organizations. She served as the Director of HR in a boutique reference laboratory, providing the full-cycle of HR services to employees, with a focus on performance management and employee relations. 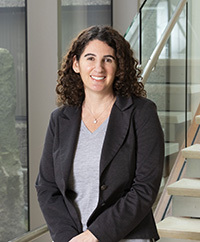 Earlier in her career, she spent 9 years managing human resources at the billing & financial services company for the Beth Israel Deaconess Medical Center where she oversaw the design and delivery of all HR programs and services. When not working, Marilyn enjoys spending time with her husband and two teenage daughters. She is her girls’ biggest fan on the sidelines of all of their sporting events and is told that she cheers the loudest. In her spare time, Marilyn loves to spend time at the beach, playing tennis or taking Zumba classes. Marilyn holds a B.A. in Psychology from Williams College and a Master’s of Health Services Administration from the University of Michigan School of Public Health.